Dental implants are very similar to your natural teeth in that it is extremely important to properly care for your gum tissue and the supporting jaw bone. 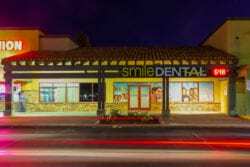 Smile Dental Group in West Lancaster, CA wants you to be informed about the best way to care for your dental implants. If you care for your implants properly, they can last you a lifetime. During the inflammation process, as your gums swell and recedes, dental implants can become covered in the sticky plaque that, if left undisturbed, can become dental calculus. Calculus is the medical name for the rough hard deposits that can form at the base of teeth or implants and eat away at the supporting gum and bone that surround and hold them in place. Once calculus has formed, this substance can no longer be removed with a toothbrush or floss and can only be removed by a dental hygienist. Leaving calculus untreated can lead to further gum recession of the gum tissue, bone loss and may eventually result in the implant falling out. Dental implants should be kept clean and plaque free by brushing twice a day and flossing to avoid calculus and gum disease. Brushing and flossing your teeth and implants after meals to remove particles of food that feed the bacteria in plaque is especially important. It is recommended to brush with an ADA- approved toothbrush, paying special attention to all sides of the implant. In addition to performing dental hygiene at home every day, but be sure to schedule regular visits to your Smile Dental Group dentist. It is recommended that you have a professional exam and cleaning every 3-6 months to avoid minor problems becoming major ones. You should also have x-rays taken of your dental implants annually to examine them for any possible problems. Without consistent daily care, implants can develop problems. Bleeding is usually the first and most prominent sign of a problem. Bleeding from the implant site is known as mucositis. Research suggests that this is reversible if caught early and successfully treated. if it progresses it usually leads to bone loss, also known as peri-implantitis, which is not a reversible condition. If peri-implantitis is not addressed, there can be advanced bone loss and the implant can even loosen or fall out. The dentists and hygienists of Smile Dental Group need to probe and measure the gums around the implant the same as they do around your teeth. They need to check and compare x-rays annually, searching for looseness, and check the bite and that all of the components are connected to the implant and functioning properly. 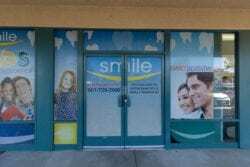 If you think you would benefit from implants due to missing or broken teeth or the implants you already have need follow-up care, Smile Dental Group in West Lancaster, CA is ready to help. Please call us at 661.383.0186 or schedule a consultation online today!